This is classed as a creatine blend, it contains multiple types of creatine to assist in a quicker absorption rate into the body than traditional creatine monohydrate. It is also designed for less water bloating. It has a key role of recycling and restoring adenosine tri-phosphate (ATP) levels which is the vital energy source for muscle cells during muscle contractions. As a result, this increased energy stimulates protein synthesis, increasing muscle strength and size whilst also improving recovery. 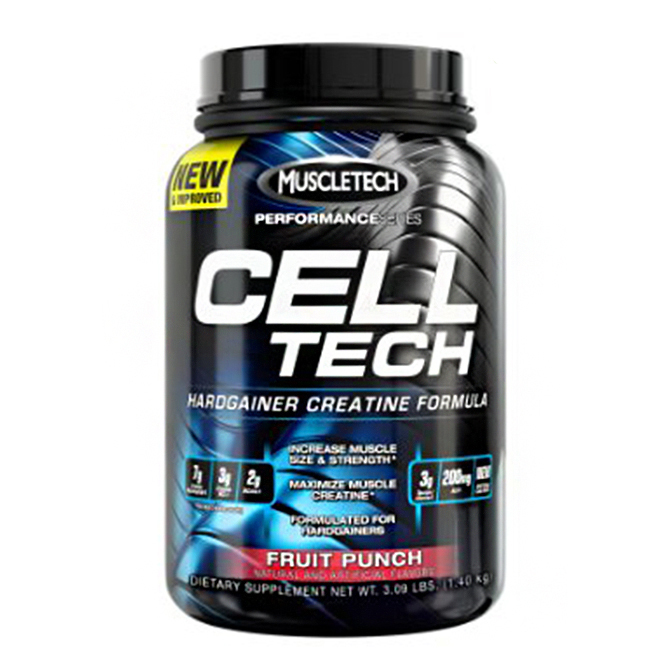 Celltech contains a whopping 7g of Creatine Monohydrate as well as 3g of Creatine HCl in just one serving to better suit your needs for lean muscle gain, muscle recovery and muscle volume. This product is ideal for those who are having trouble putting on muscle quickly. 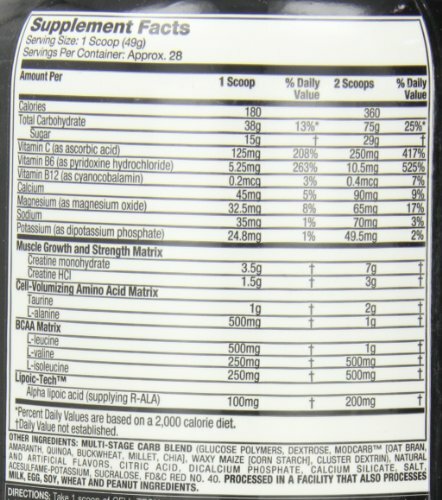 In addition to a concentrated amount of creatine, this supplement also contains alpha lipoic acid. Alpha lipoic acid increases the absorption rate of creatine so that your muscles are getting their nutrients rapidly and more efficiently. Celltech also contain carbohydrates to assist with glycogen storage levels and also BCAA’s to enhance muscle recovery. Creatine: is naturally found in many foods such as meat and seafood but is significantly lost once the food is cooked. Thereby increasing the everyday intake of Creatine can improve muscle growth, endurance and performance. Creatine has a key role of recycling and restoring adenosine tri-phosphate (ATP) levels which is the vital energy source for muscle cells during muscle contractions. As a result, this increased energy stimulates protein synthesis, increasing muscle strength and size whilst also improving recovery. Taurine: is known to enhance endurance by increasing metabolism and protein synthesis. Consumed daily. Follow directions on nutritional label found on the product for best results.